Cost/Cover: Suggested contribution is $12 for adults, $8 for seniors, $5 for juniors, and $24 for families. Details: With tight harmonies and a musical ensemble that includes clawhammer banjo, mandolin and guitars, the effect is to leave listeners with only what matters: the heart of the song and clarity over ornamentation. After leaving their home base of Virginia and living on the road for 2 years, Laura and Kagey now call Baltimore, Maryland home and it's where they wrote and recorded their fourth full-length album, Tangled Country, released May 2015. Acoustic Guitar Magazine describes the set of songs as "a handcrafted sound centered on swarming harmonies and acoustic guitars that churn like a paddlewheel and shimmer like heat waves on the highway." And like their stage performance, these songs rock and reel, and then they console you when you come back down. The Honey Dewdrops have a busy year ahead of them with festival appearances across the country and a new record on the horizon (slated for release Fall of 2018) along with their first UK tour in Jan/Feb 2019. Mark Mandeville and Raianne Richards are inheritors of a timeless legacy, creating music that is both original and evocative of a rich tradition. 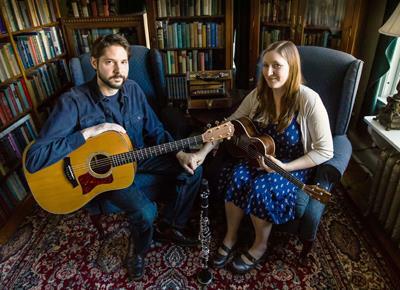 Blending distinctive voices and a wide range of accompaniment (guitar, harmonica, ukulele, clarinet, penny whistle, electric bass), their songs have been well-received by audiences around the eastern United States and Canada since 2010. The performance will take place in the church's handicap-accessible Fellowship Hall. Coffee, tea, and delicious homemade desserts will be available for purchase.